Far North is a gut-clenching exercise in pointlessness. It's not as bad as another Sam Shepard written and directed bit of nonsense known as Silent Tongue but that's like saying the eruption of Mt. St. Helen's wasn't as bad as the eruption of Mt. Vesuvius. Why actors Charles Durning, Jessica Lange, Tess Harper and Patricia Arquette didn't just say "Hell no" when they read this script is anybody's guess. But they must have seen something in it, I imagine, but I have no idea what that would have been. 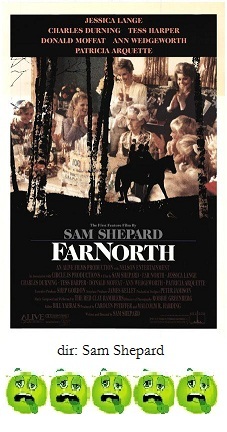 Far North is essentially the story of a dysfunctional Minnesota family who must grapple with the wrenching, soul-searching decision of whether or not....to shoot a horse. The family's patriarch, Charles Durning is thrown from the horse and is hospitalized with grave injuries. His daughter, just in from New York (Lange), goes to visit dad. He tells her that what he wants her to do is to shoot the horse. He believes the horse did it on purpose. The horse meant to kill him; therefore, the horse must die! Back home, Lange's sister (Harper) wants the horse to live; the horse doesn't deserve such a fate, etc. And for 92 min. of running time, all of the members discuss whether or not to shoot the horse. I'll tell you one thing, by about the half hour mark I was ready to gun down the damn animal myself just so all of these petty and repetitious arguments would just end. There are a couple of sub-plots to be sure. Lange wrestles with the problem of her unexpected pregnancy. Harper is worried about her slutty daughter (Arquette, who's performance here consists of doing all of her lines in a series of screams and shrieks). Durning escapes from the hospital with the help of his alcoholic brother, because, basically the horse isn't dead yet, so he feels that he has to do it himself. Far North has endless scenes of Durning and his brother (Donald Moffatt) wandering around the woods trying to get back to the house. Endless arguments between the sisters about, you guessed it, that damn horse. At one point, all six major characters are wandering around the woods in the dark at the same time for no apparent reason. Shepard, obviously, has a thing for wandering characters yelling each other's names for extended periods of time. (He did much the same with wandering characters in the desert with Silent Tongue). Well, you get the idea. I wouldn't dream of telling you whether or not the horse gets shot. You'll just have to suffer through Far North yourself. If I have to do it, you have to do it.